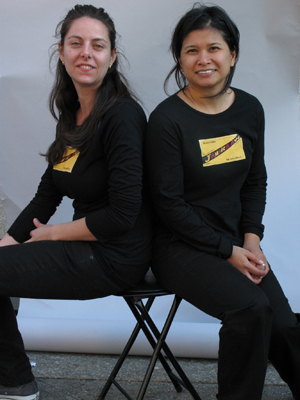 Athena Robles and Anna Stein have backgrounds in sculpture, drawing, design and installation. As Double A Projects, they make public, interactive projects that explore generosity, exchange and audience engagement. They are best known for their works Global Free Store, Counter Culture Cash and Idea Store. Since 2007, they have presented their work in storefronts, markets, galleries and art fairs and have participated in panels for universities and conferences. Robles and Stein have received national and international media coverage for their work, appearing on MSNBC, CNN, and BBC among others.